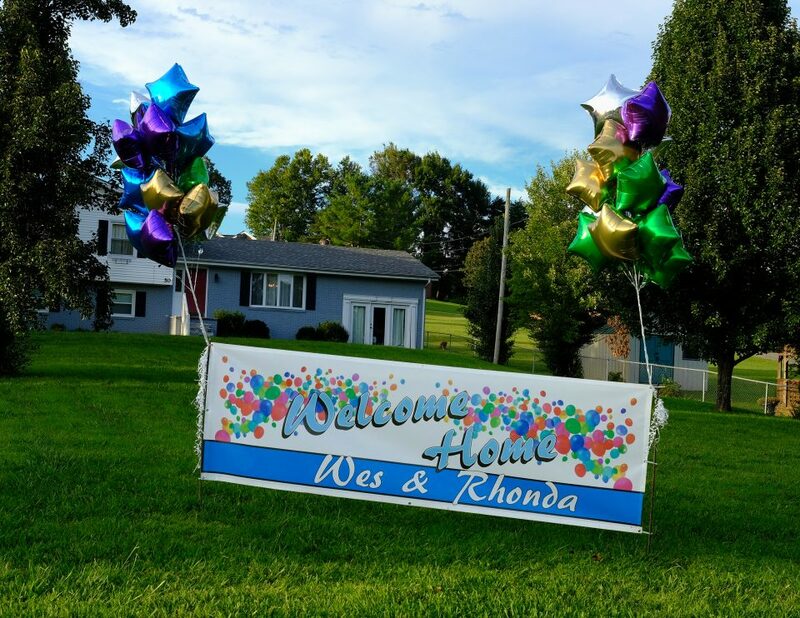 Last night Wes and Rhonda came home from the Markey Cancer Center in Lexington, Kentucky after a 29 day stay for extensive chemo and treatments. I’m not sure I’ve ever seen a bigger smile on Wes’s and Rhonda’s faces than when they sat down on his patio surrounded by neighbors, friends, and his children! Wes has been declared cancer free! Now all he has to do is walk the long walk back to full strength! With Rhonda by his side I have no doubt he will make it! Rhonda has been the living example of a great wife and partner. She never left his side through out the 7 month fight, and as her father-in-law I’ve always loved and appreciated Rhonda, but my respect has risen to an all-time high! There is no doubt in my mind that all of this is because of you! The outpouring of concern and the fervent prayers of all our friends, and their friends and people we will never meet until in eternity they walk up to Sherelene and I and say I prayed for Wes! If you don’t believe me, ask his doctors and staff of both hospitals and cancer centers, they will tell you his recovery was filled with miracles. I am sharing this because, from the deepest part of my heart, I want to thank you, and I want you to know that God is there and He cares and still hears our voice and still performs miracles! I pray that everyone that reads this post will know that this is “real”. If you are walking though this life without Him, how are you going to face these difficult times that come into everyone’s lives eventually? Inspite of the severity of Wes’s fight, with this disease, God continually gave me a peace that past all understanding. I desperately want that for you too! I don’t ever want you to have to walk through anything like this without His precious hand on your shoulder. If I could wrap up His love and give it to you as a gift, I would!!! Unfortunately that’s not how it works!!! Each of us has to come to a place where we realize that we simply can’t do this thing called life in our own strength. We can’t carry the burden of all our faults and actions on our own. Only One can lift the burden and give us true peace and comfort. Jesus stands at the door and knocks and asks if He can come in. It’s simple, open the door and ask Him in and ask Him to forgive you and make you new. You’ve given me the greatest gift, my son back, please join me in reaching out to a lost world and encourage the lost to find the way! For some time I’ve known that ask James Taylor sings “That’s Why I’m Here” that is my purpose and my mission. I want to share God’s unending, uncomprehendable Love with all that don’t know it! There is nothing more imporant we can do with our lives than to steer others to Him! Thank you again, from the bottom of my heart! Such good news! Thank you for sharing with us how God has performed miracles for Wes and your family! Bill, Been waiting for this post ~ Great News! All I can say is “God is Good” my friend ~ Keeping your entire family in our prayers ~ Please give my best to Wes and his family! He so appreciated all you did David, to God be the Glory! Fantastic news! Wes is an encouragement to all those who have seen their prayers for Wes answered. Bill, all your posts are great but this one is very special. Special indeed! Thanks my friend! This is absolutely fantastic news. I am so happy for all of you — Wes and Rhonda and their family — for you and your wife — and the whole Fortney Clan. As you said, God is there and He does listen to our prayers!! …and I want everyone to know it!!! Thanks Mike, miss seeing you! Such awesomely wonderful news! Hallelujah and Amen. Sure is sweet to have him home! thanks sRick! This is one of the best posts ever. It’s time for celebration and thanksgiving. You bet David, and I’m celebrating!!!! Great news. So happy for your family. Praising God. Such wonderful news. I’m so happy for Wes and all his family. Thaka you Lynn, looking forward to December!!! Thank you…. not sure what thaka is !! God is good … all the time! Awesome news from the Fortney household. Amen, God is truly good!!!! This is such good news. We are so happy for Wes and his family and you as well. The prayers of many have been answered. That’s great news Bill. Fighting the good fight.